He painted with the solidity of the Emilian Baroque, to which he added rich Venetian colour, yet his work remained academic and occasionally almost Neo-classical in style. In 1691 he painted the Charity of St Lorenzo Giustiniani (Venice, S Pietro Castello), a large, dramatic composition, in which the figures are rhythmically arranged against a theatrical architectural setting. In 1694 he was commissioned by the Venetian state to decorate the Arco Morosini in the Sala dello Scrutinio in the Doge s Palace. His style developed very little: the Pool of Bethesda (1719; Venice, Fondazione Cini) and two vast canvases of biblical subjects, Solomon Riding David s Mule and the Coronation of Joash and the Death of Athaliah (both Agordo, Chiesa di Prompicai), are grandiose, multi-figured compositions that retain a clear, academic draughtsmanship. His mythological works include Aeneas and Mezentius (Macerata, Palazzo Buonaccorsi). 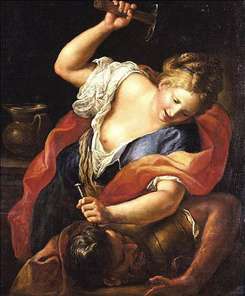 See more details about "Jael and Sisera"